A member from Oak Hill County Club in Rochester, NY came to me looking for a poster to promote the annual Ladies Golf Tournament. 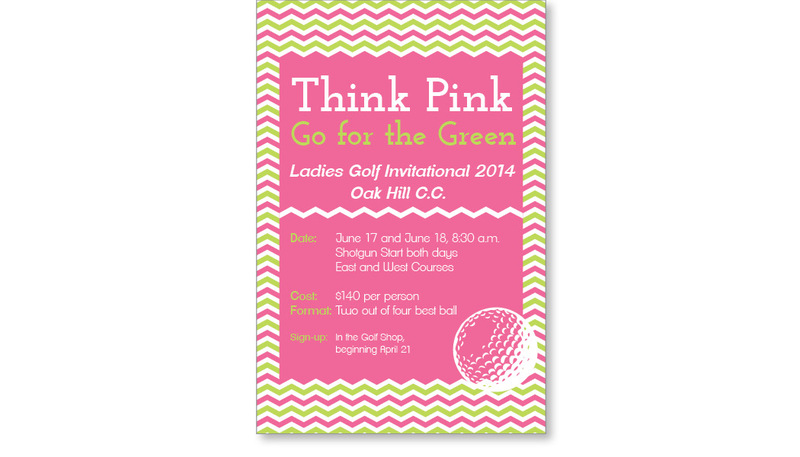 “Think Pink, Go for the Green” is the 2014 theme and the ladies were looking for a fun design to reflect that. They were looking for something different than the traditional putting green photo. The result was a preppy chevron print that incorporates both pink and green and is perfect for summer. The poster stands out immediately and draws the female audience in to learn more and sign-up for an enjoyable event.